An AMD Radeon HD7850 based graphic card will be available from PowerColor as a solution for mainstream users, the SC3HD7850 will be equipped with 1GB of GDDR5, big heat sink using four heat-pipes for cooling, slightly over-clocked over the standard design, bellow a press release about it. TUL Corporation, a leading manufacturer of AMD graphic cards, today unrolls a new model of SCS3 series, the SC3 HD7850. Being a new generation of SCS3, the HD7850 extends PowerColor strong capability of passive cooling design, enables gamers to play under extremely silent environment. Together with 1GB of GDDR5 memory, and 1024 units of stream processor, the SCS3 HD7850 is equipped with all high standard specification, also includes the latest AMD Eyefinity technology, DirectX 11.1, and AMD App Acceleration technology, enabling quiet gaming but also with performance. The HD7850 strengths passive cooling solution with PowerColor patent G-shape heat pipes, which provides the same cooling effect as dual U-shape heat pipes, efficiently cooling down the temp. through enlarging the cooling surface. Also, armed with 6 X 6 ø heat pipes can easily dissipate the heat through the solid cooling based which fully cover GPU and key components, providing an absolutely silent and excellent cooling performance without any compromise. Furthermore, the HD7850 uses intensive and enormous surface of aluminum cooling fins can double the dissipation efficiency of heat away from copper based which fully covers GPU. 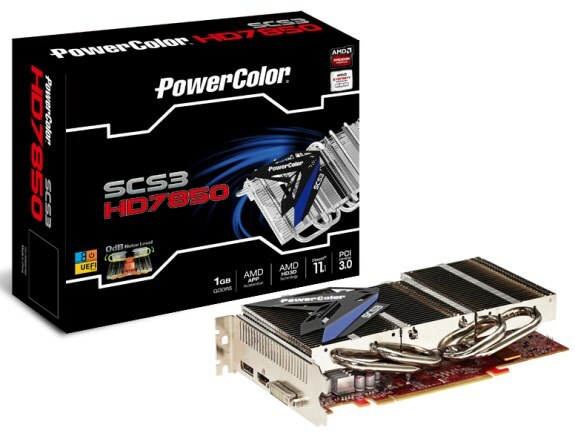 PowerColor SCS3 HD7850 is built by solid combination, the exclusive Gold Power Kit. PowerPAKSO-8 inside can provide stable voltage and high Peak Efficiency up to 82%; Ferrite Core Choke offers 33% extra power for GPU; Solid Capacitor secures 50,000 hours operating time. All these firm ingredients make PowerColor SCS3 HD7850 undefeated, and bring absolutely no-compromise gaming experience to every gamers.